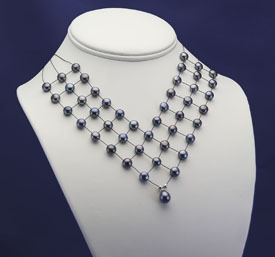 This classy presentation of black button pearls is accented by a 10mm by 8mm drop black pearl. The 44 button pearls measure 7mm by 5mm and are held in place by black wire. The drop pearl hangs at the bottom and moves with you, giving just the right accent. This necklace is 16 inches in length, and features a spring ring clasp. This necklace is delivered in a boxed white leatherette portfolio perfect for gifting.